The global diabetic foot ulcers and pressure ulcers market depicts the presence of few market players, says Transparency Market Research on the basis of a recently published report. In spite of this consolidated scenario, a decent number of small- and large-scale enterprises are firmly establishing themselves in the market, thus giving rise to a healthy competitive spirit to exist in the vendor landscape. The competition is expected to remain high and is prognosticated to intensify in the next few years, according to market experts. Thus, new companies might find it difficult to establish themselves in the market owing to a widespread presence of old businesses. M Healthcare, Smith & Nephew Plc., Molnlycke Health Care AB, Medtronic Plc, ConvaTec, Inc., B. Braun Melsungen AG, Organogenesis, Inc., Acelity L.P. Inc., Medline Industries, Inc., Coloplast A/S, and BSN Medical GMBH, are a few players operating in the global diabetic foot and pressure ulcers market. Improving treatment procedures, regulating costs, and carrying out extensive research and development are three main strategies implemented by most players working in the global diabetic foot ulcers and pressure ulcers market. 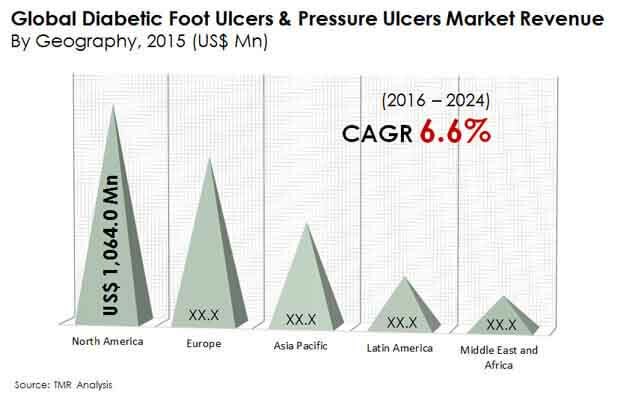 The global diabetic foot ulcers and pressure ulcers market is projected to exhibit a positive CAGR of 6.6% CAGR between 2016 and 2024. Thanks to this, the market’s valuation will reach US$4.9 bn by the end of 2024, a significant growth achieved from an earlier revenue worth US$2.8 bn clocked in 2015. The global foot ulcers and pressure ulcers is primarily being driven by a rampant rise in chronic diabetes affecting thousands of people on a yearly basis. This is mainly due to the fact that people affected with diabetes are prone towards bruises and ulcers caused on feet and even other parts. Additional chronic ailments such as prolonged hospital stays, neuropathic diseases, and reduced mobility also has been responsible for driving the global diabetic foot ulcers and pressure ulcers market. Rapidly increasing geriatric population is another cause for the market to attract a substantial pace as old-aged people are highly prone towards developing pressure-based ulcers and bruises. With a rising awareness among the masses to treat these maladies, a higher demand for relevant medications is being felt, consequently propelling extensive growth in the global foot ulcers and pressure ulcers market. However, high costs of opting for ulcer treatments is notably hampering the diabetic ulcers and pressure ulcers market. Many underdeveloped and remote regions depict a lack of healthcare experts, consequently restraining the market’s growth. Nevertheless, improved biologics are expected to offset restraints affecting the global foot ulcers and pressure ulcers market’s growth, thus strengthening the ability of the market to garner a handsome revenue. The global foot ulcers and pressure ulcers is primarily being driven by a rampant rise in chronic diabetes affecting thousands of people on a yearly basis. The competition is expected to remain high and is prognosticated to intensify in the next few years, according to market experts.